Women Of God Arise! 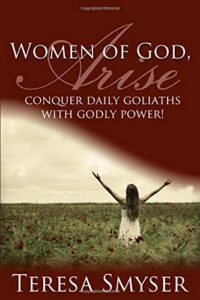 By Teresa Smyser is a powerful book that discusses what it means to be a woman of God. Using personal anecdotes and portions of scripture the reader learns how to be an effective woman of God. Life is a spiritual battle. We need to be prepared by putting on the full armour of God. We need to both stand and meditate on God’s Word. We were created to be in a relationship with God. Do not let Satan distract you. Deflect his arrows with the Word of God. Surround yourself with godly friends. Women who love you enough to tell you the truth about the state of your walk with God. God never promised ‘fair.’ “When it’s not fair, it doesn’t mean God’s not there. Trust Him.” God has promised to never leave us nor forsake us. In the times of trials He walks alongside us. Each chapter has questions designed for personal examination. The book ends with testimonies of faithful servants. Women Of God Arise! is a really powerful book that we would all be wise to invest in to help to strengthen our walk with God.